fra 95. BG gået tabt. Ardennes American Cemetery Plot B Row 39 Grave 16 i BELGIEN. Hæderstegn: Air Medal, Purple Heart. (Kilde: ABMC) Se Monument for 46 amerikanske flyvere. Se tegning af besætningen på en B-17, Foto af en B-17 + B-17 i airmen.dk samt B-17 Ball Turret, Ammunition og Ball Turret Gunner. B17 4229702 * B17 423286 * B17 4230118 * B17 4229675 * B17 423187 * B17 4230164 styrtede alle ned i dele af Østersøen. 10 flyvere. "On 13 June 1943 60 B-17s from the USAAF attacked the U-boat installations in Kiel. 16 B-17s from 95th BG flew at the front in the formation which had already been attacked on their way to the target. As usual the German fighters particularly attacked the front of the formation. Before it had passed the target 7-8 B-17s from 95th BG were lost. One B-17 out of control crashed into another, and only 6 B-17s from 95th BG made it back to base - and one of them was destroyed in a forced landing. Due to the violent battle nobody in the area observed this plane being lost. A few days later the bodies of 4 crew members were washed ashore on the south coast of Lolland. Then the loss was a reality." He stills rests there. He entered the Service from Massachusetts. 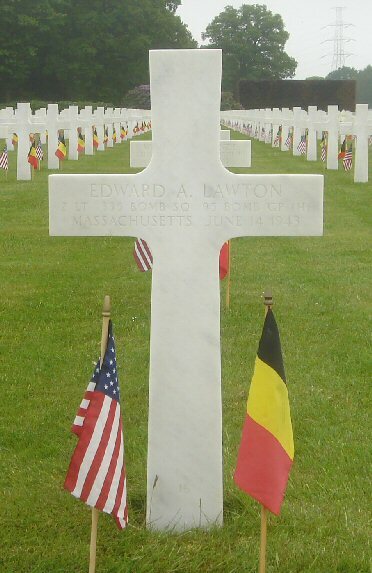 Buried at Ardennes American Cemetery Plot B Row 39 Grave 16 in BELGIUM. Awards: Air Medal, Purple Heart. (Source: ABMC) See Monument to 46 American airmen. B17 4229702 * B17 423286 * B17 4230118 * B17 4229675 * B17 423187 * B17 4230164 all crashed in parts of the Baltic Sea. See a drawing of the crew of a B-17, Photo of a B-17 + B-17s in airmen.dk and B-17 Ball Turret, Ammunition and the story of a Ball Turret Gunner. It took off from RAF Framlingham (Parham) - USAAF Station 153. 10 airmen.